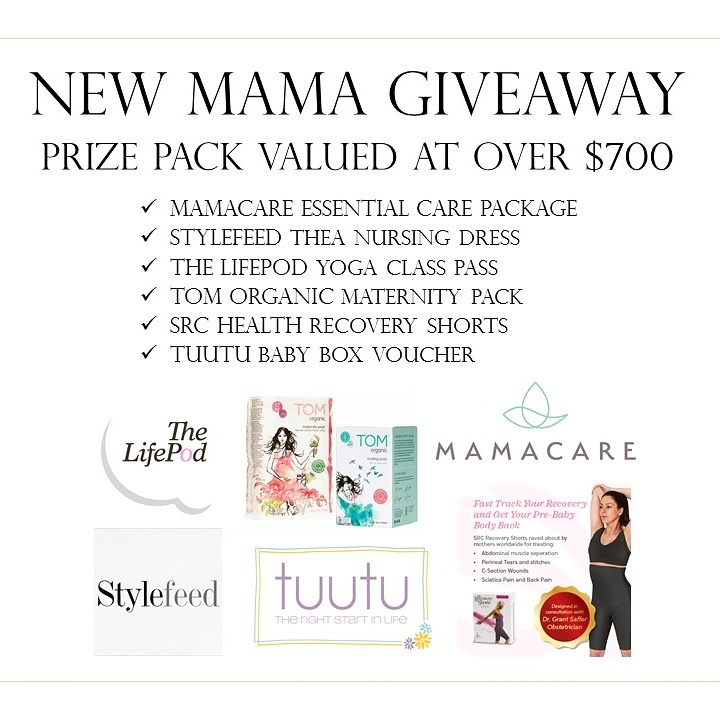 You are here: Home / Breastfeeding and postpartum care / New Mama Giveaway: WIN a $700 prize pack! At the end of last year I rolled out my new business, MamaCare Health Services, an in-home postpartum health program. As part of its official launch this month, and to help spread the word about this wonderful service, I’m doing a HUGE giveaway through Instagram. The prize pack, valued at over $700, is a collection of exceptional items and services specifically designed to support new mothers. A number of awesome local companies have joined with me to put this offering together, and I couldn’t be more grateful! MamaCare Health Essential Care Package: 1 x prenatal in-home visit, 1 x postpartum in-home visit, text / phone / email support between appointments, MamaCare postpartum resource folder, and postpartum medicinal herbal bath mix. Stylefeed ‘Thea’ Nursing Dress: The classic T-shirt dress, designed for style and comfort, featuring an invisible zip to allow easy access for breastfeeding. This new Australian company designs and makes fashionable breastfeeding clothing for style savvy mothers. The LifePod Yoga Pass: 5 class pass for prenatal or postnatal yoga (babies welcome) at their Double Bay studio. Classes are taught by the beautiful Lauren Falconer, who is also a doula and Calmbirth instructor. TOM Organic New Mother Pack: 3 x organic cotton maternity pad packs and 3 x organic cotton nursing pad packs, in a gorgeous organic cotton tote. SRC Health Recovery Shorts: These amazing recovery shorts help to activate muscles, reduce swelling, reduce pain and aid wound recovery. Anatomically designed support panels fit with the natural curves of the female anatomy, while delivering consistent gentle medical grade compression. Tutuu Baby Box Voucher: 25% off the purchase off any baby box – an Australian take on the Finnish classic! To enter, you need to go the the MamaCare Instagram post from today, follow the account, like the post and tag a friend. For every friend you tag, you will be given an entry (must be separate posts). Additional entry for following the Instagram accounts of all other collaborators (details in the giveaway post). The competition will close at 5pm (AEDT) on Friday 3rd February 2017 and the winner announced the following Monday. The New Mama Giveaway is open to Australian postal addresses only. The services being offered by MamaCare and LifePod are only available in Sydney, but can be transferred by the winner (if in a different city or state) to a local recipient. To be valid, this transfer must be confirmed by Monday 13th February 2017. The services being offered by MamaCare and LifePod must be redeemed before 30th April 2017. The Tuutu voucher must be redeemed before 31st March 2017. As per Instagram’s promotion guidelines, this promotion is in no way sponsored, endorsed or administered by, or associated with, Instagram.